Trading Places? VAT and Customs Treatment of Imports, Exports, Intra-EU Transactions, and Cross -border Supplies of Services in the Digital Age introduces the main concepts and trade facilitation reliefs that businesses must understand if they are to trade internationally with the least intervention and disruption from the Tax Authorities. The worst-case scenario is for an importer to have their goods still within Customs’ control, instead of being where they are needed because the correct procedures have not been followed. Allied to this is the need for businesses to utilise all available reliefs to minimise the amount of duty and import VAT payable - whilst import VAT is recoverable by most businesses it is still a major cash-flow cost, which has to be funded, whereas customs duty is an absolute cost. The book highlights the means of importing goods and arriving at the Customs value on which import duty and import VAT are computed. 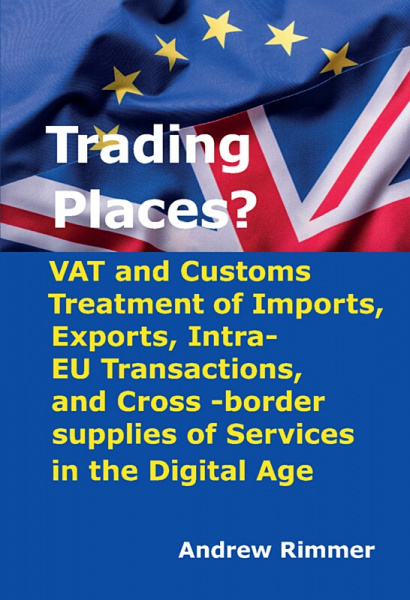 It also provides commentary on export procedures and the VAT treatment of intra-EU trading, including potential fiscal barriers to exploiting non-UK markets. Andrew Rimmer is a vastly experienced VAT and Indirect Tax Consultant, with over 40 years’ experience of the subject matter. Andrew established his own company in order to advise all sizes and types of business and entrepreneurs on VAT and Indirect Tax matters. Andrew was previously employed by large professional services’ practices and began his career with H M Customs & Excise. 9.13 Supplies to diplomats, “international organisations” etc.